A student’s mother had cancer and the student was feeling depressed, isolated and alone. Rinpoche spent a lot of time checking and advised the following. Diamond Cutter Sutra: five times, by Kopan Lama Gyupas. Regarding your feelings of isolation and separation, that is the result; you don’t know this, but it’s a very positive thing happening. For someone who doesn’t know Dharma, that person thinks of it as sickness, a mental problem, thinking it’s wrong, but it’s a very good thing. However, a person who doesn’t know that thinks of it as mental sickness. In your case it’s something like a result of having generated renunciation in a past life, having practiced renunciation in a past life, seeing the suffering nature of samsara. So now, rather than getting attached to samsara, to friends and materials, you are not feeling that [attachment.] That is from having practiced renunciation in the past, seeing the nature of samsara, the nature of suffering, the cause of suffering. So instead of being attached to outside objects, you withdraw from these things. It’s like a Dharma practitioner who has realized renunciation or is coming near to that, so it is like that. But it is very positive and what it really means is that you can become a pure Dharma practitioner, and from that you can realize the true nature of suffering of yourself and all sentient beings, then it is easy to generate bodhicitta. Also, I want to say how you are thinking about depression, that this is a little like how other people think; that it is something uncomfortable and wrong. I would like to remind you that there are numberless buddhas and bodhisattvas who cherish you most. You have to remember that all the time there are numberless buddhas who cherish you most, who cherish all sentient beings, and that includes you. Remember that every day. Therefore you have to do what they like, what pleases the buddhas the most, so from that you can understand you should read lamrim and Shantideva’s Guide to the Bodhisattva’s Way of Life. Basically, read those texts and study Buddhist philosophy, but those texts are the main ones—lamrim and A Guide to the Bodhisattva’s Way of Life. So there is nothing wrong, in reality nothing is wrong. You can have a positive mind, but if you don’t know Dharma, then you think it is mental sickness. Other books you should read are Wheel of Sharp Weapons and Nagarjuna’s Letter to a Friend. These books are good to read, so you can understand that even though the suras [demigods] have incredible, unbelievable pleasure compared to human beings—the pleasure of human beings is very poor compared to them—but still it is in the nature of suffering. The highest pleasure in human life is also really in the nature of suffering. If you read more lamrim and A Guide to the Bodhisattva’s Way of Life, in this way you will see how samsara is in the nature of suffering, then you will understand how it is positive, very positive, and because of that you will have more thoughts of cherishing others, more good heart. A Guide to the Bodhisattva’s Way of Life, also with commentary; there is a commentary by His Holiness the Dalai Lama. You will learn a lot from these teachings. 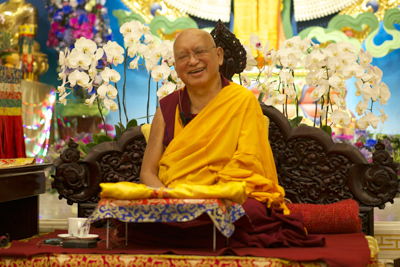 This extensive advice was given to a student who wrote to Rinpoche about a range of personal problems. The student had health issues including severe depression and high blood pressure. He was also experiencing financial hardship and many other obstacles in his life. Thank you very much for your emails. I am sorry for the long delay. To achieve enlightenment in this life means to free the sentient beings from oceans of samsaric suffering quickly and bring them to enlightenment quickly. Therefore you need to achieve buddhahood in this lifetime, quickly, and in one brief lifetime of degenerate time. The two main deities that you have a strong karmic connection with are Most Secret Hayagriva and Chenrezig Gyalwa Gyatso. From these two deities it seems you have a stronger connection with Most Secret Hayagriva. You can take both initiations, but when the time comes for you to do retreat, your main deity is Most Secret Hayagriva. Most Secret Hayagriva is an extremely powerful deity for pacifying obstacles and for success. The particular function is to dispel obstacles and the need to control sentient beings to bring them to enlightenment. Until you receive the initiation you can recite the Most Secret Hayagriva mantra for the time being. Later you can receive the initiation and do retreat. If you can receive the oral transmission of the mantra that would be very good. Maybe I can give it to you by phone if you send your number, if you want, then it’s more powerful when you recite the mantra. Regarding my own experience with high blood pressure, there is one student who had very high blood pressure and when he was in Nepal he asked me what to do. I gave him the meditation practice of tonglen, which is taking other sentient beings’ sufferings and the causes, delusion and karma, and giving one’s merits and happiness up to enlightenment to other sentient beings. He did the meditation and every time he did it, his blood pressure went down. Whenever he did it, maybe for half an hour, his blood pressure always went down. So that’s proof. This also came out in my observation for you, that it’s best for you to do tonglen. I have written different things on tonglen. [See: The Preliminary Practice of Tong-len and my advice on tonglen.] Some of it isn’t relevant, but you can take from it the different ways to meditate on tonglen. The advice Dealing with Cancer contains tonglen practice within it, so that is the part that is relevant for you. One Nepalese lady in the USA had high blood pressure and went to the doctors and took many medicines. I told her to do tonglen practice and gave her some blessed pills. Her blood pressure went down after that, but I haven’t met her for a long time now. So please do tonglen practice. In regard to your obstacles for finance and wealth you need to practice Yellow Tara meditation. Don’t worry about your wife. You have to know that since we are in samsara, it is our nature that once we are born we will die. Only if we actualize the four noble truths, the ultimate wisdom directly perceiving emptiness, then we can cease delusion and karma, the cause of suffering. Then we can be free from the suffering of samsara, and we don’t have to die. We will be free from old age, sickness and death, like arhats. Otherwise after we are born, we have to die. Also, you have to know that every sentient being has been your wife and you have been the wife of all sentient beings. You have been mother and father of all sentient beings and the enemy of all sentient beings as well. So that experience is nothing new, it is not the first time. We have had this experience numberless times, but we don’t know because we don’t have omniscient mind, we don’t even have ordinary clairvoyance. We think we only have one life, only this life, so we have a very limited mind, very obscured, like a blind eye, a very blind eye, like that. To begin with, regarding depression, you are much, much better than numberless other human beings in the world, who have one hundred times, two hundred times or even one thousand times greater problems than you. Many numberless others are much worse off than you. Thinking like that, you should feel very happy, very fortunate. And there will be happiness in the future. Therefore, feel happy about this current suffering. That means experiencing the suffering while thinking about the benefits of that suffering. By experiencing the suffering now, it finishes our past heavy negative karma and in the future [we] will be like the sun shining in the world. The one sun in the universe, when it shines on the animals, like flies, bees and all insects, they can all enjoy it; and all the human beings and all the flowers and so forth also enjoy it. In the future you will have so much happiness, therefore it is very good to have the suffering now. That is the benefit of suffering now. The conclusion is that it is very good, very fortunate to experience it now, otherwise what happens if you don’t suffer now, if you don’t have problems now, then you continue to create a lot of negative karma and you will be reborn in the lower realms, in the hell realms, as a hungry ghost or an animal for eons and eons. You will experience unbelievable suffering there. The suffering of the lower realms, the unbearable suffering of the hell realms, is so great that one hour or one minute there is unbearable. If it is conveyed as a material thing, how much suffering you experience is as large as the sky. Therefore, compared to the hell realms especially, where the hell beings are experiencing the heaviest suffering, the suffering you are experiencing in the human realm is great peace. It’s like nirvana, it’s like liberation from samsara; it’s great peace compared to the hell realm sufferings. You have to recognize this. You have to feel that there are many advantages to having the problems now. It is said by the great bodhisattva Shantideva that if you have problems it destroys your arrogance and pride, and then compassion arises for others who are suffering in samsara. Therefore, think about others who have similar problems. For example, people with AIDS have a lot of compassion for other people who have AIDS. Like that, we become more careful to not create negative karma, which is the cause of suffering, and we wish to create more good karma, the cause of happiness. Whether it is great or small, we must abandon negative karma, because we don’t want even the smallest suffering, even in our dreams. Thinking like this helps compassion for others to arise and it becomes the cause of generating bodhicitta for other sentient beings. It helps to study the Middle Way view of emptiness only—the two truths, ultimate truth and conventional truth. Study and practice as much as possible, in order to realize emptiness. That eliminates the root of samsara—ignorance, holding the I as it appears truly existent, existing from its own side, existing by its own nature, a real one, and believing in that one hundred percent. That is ignorance, the root of samsara. However, the I exists in mere name and is merely labeled by the mind; there is no other I than that. There is no real I. “Real” means existing from there, from its own side. So that’s the reality. If you can meditate on this, that would be very good. You can use even simple words on emptiness to meditate. For example, this I is not truly existent. Meditate on that. The reason is that it is dependent arising. Regarding the meaning of dependent arising, there is gross dependent arising, which is depending on cause and conditions. That is gross dependent arising. Subtle dependent arising is that the I is merely imputed by the valid mind on the valid base, the aggregates that we have now. That is how the I exists. It exists in mere name. Meditate on that. The I is merely labeled by the valid mind, related to the valid aggregates that we have now. Meditate on that. This will help you very much. The root is ignorance. That is the root of the oceans of samsara sufferings and the causes, delusion and karma. This is the best way to eliminate depression. Please do the morning motivation, The Method to Transform a Suffering Life into Happiness (Including Enlightenment) every day. 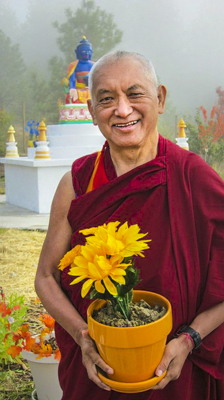 A student was experiencing debilitating depression and anxiety and wrote to Rinpoche for advice. Thank you very much your kind emails, I read them all. I am sorry I didn’t get to reply your first emails. Now by doing observation I am telling you it came out very good for you to read the Vajra Cutter Sutra. Please read it three times and please read it mindfully. Please read this very soon and read it very mindfully. It purifies negative karma collected from beginningless time and collects extensive merits and wisdom, and plants the seed of the path, particularly realizing emptiness. If you read the sutra with bodhicitta, it plants the seed of enlightenment. Then, have this puja done: gya tong pa (8,000 Verse Prajnaparamita.) You also need lu zong puja. This is my advice for now. A long-time student wrote that he was depressed and lacked energy to work at the Dharma center. Thank you for your email. I am sorry for the long delay. Read Liberation in the Palm of your Hand if you can, especially the section on guru devotion. Also think, “I may die this year, this month, this week or today. There are so many human beings who die in the mother’s womb, right after birth or as children. They die when they are young or when they are old, at all kind of ages. This could be me.” Think like that. After death, even though the body disintegrates, the consciousness continues. There is no third way; there are only two ways—either rebirth in the lower realms or a higher rebirth. If negative karma is what we have done the most and that is the strongest, then we will be reborn in the lower realms. That is karma. If good karma is what we have done more of, then mainly we will receive a higher rebirth. We ordinary beings try to practice Dharma, but it’s difficult for it to become pure Dharma. We can understand how this is not easy by examining our actions from morning to night, whether they become Dharma or not. Just because we are doing prayers it doesn’t mean that is Dharma. It depends on the mind. Just doing prayers or meditation and so forth doesn’t define Dharma; it depends on the mind. If the mind becomes Dharma then our actions of body, speech and mind become Dharma. For the mind to become Dharma it needs to be unstained by attachment to this life, therefore first we need to generate renunciation. We can see that praying and meditation doesn’t define our Dharma practice, it’s our mind that defines whether something is Dharma or not. If the mind is not Dharma then all the actions of our body, speech and mind also don’t become Dharma. There is no need for you to be sad or depressed, because you have met the Buddhadharma. Other people in the world have not had this opportunity. They don’t believe in reincarnation, karma and haven’t met the Dharma, so they are only depressed. They don’t know how to help the situation, but you have met the Dharma and you know how to purify and collect merit, therefore you are very fortunate. If you can, recite OM MANI PADME HUM with bodhicitta motivation, for all sentient beings to be free from the oceans of samsaric sufferings and to bring them to peerless happiness, the omniscient mind. That includes yourself. To really be able to benefit all sentient beings you need to achieve enlightenment also. Think more about the suffering of numberless sentient beings and then recite OM MANI PADME HUM. This is the essence of Dharma. It is very good, very rich. It is very important to think like this every day. Please read the section of the lam-rim on guru devotion and enjoy life with bodhicitta, with the good heart. Live your life with a good heart, benefiting sentient beings. You will always enjoy life with that. Thank you very much. A student had stopped doing Buddhist practices and had become depressed. Rinpoche gave the following advice. I know that being in the West in such a society with different concepts and all kinds of things, this can lead to depression. Many people in the West have this. They go through so much depression and take heavy medicine, and the medicine destroys their healthy body and mind. The essence of my advice is for you to read the section of the lam-rim on the perfect human rebirth. Read about the three types of usefulness, how it is most difficult to find again and how what you have now won’t last forever because there is death. Not only is there death, but death can happen so easily, at any time. After death, the body and mind separate, however, the mind continues. Even after enlightenment the mind continues. After nirvana and enlightenment the mind continues, and even in your samsara the mind continues. You must read that section in Liberation in the Palm of Your Hand well. Also think about the clear light nature of mind. Geshe Sopa Rinpoche said that is related to the absolute truth and the shunyata nature of the mind, which is buddha nature. The nature of mind is clear light, that’s why no matter how much suffering there is, it is temporary, and that’s why the cause of suffering, delusion and karma, is temporary. It is not oneness with the clear light nature of mind. It is not oneness with the mind. The mind is temporarily obscured due to the wrong causes and conditions. With the right causes and conditions, negative karma can be purified because of buddha nature. The ultimate nature of the mind is emptiness only. Just as a dirty towel can be washed with water and soap to remove the gross dirt, and the subtle smell can be removed by again washing with soap, so too not only the gross delusions but also the subtle obscurations can be purified by actualizing the path. The mind can be totally cleaned, and that’s why we can become enlightened. We can become enlightened because all the gross and subtle obscurations can be purified. All the qualities are there. There’s nothing more to gain. Once the gross and subtle obscurations are purified we become a buddha [Tib: sang-gye]. That’s why all sentient beings can become enlightened. No matter how great our suffering may be, we can be liberated even from the suffering of hell. These things are only temporary and can be ceased; we can be liberated from all the sufferings. It all depends on what you do with your mind. Therefore, your mind can be kept totally in great happiness by reading the lam-rim, meditating and thinking about what I said. Mainly do that, for a few months. On the basis of what I’m saying now about the nature of mind, meditate on buddha nature. You can even be free from the suffering of the hell realm, which is just temporary. It’s not forever; it’s impermanent. Compared to the suffering of hell, no matter how heavy the human suffering may appear to be, it’s great peace. It’s like nirvana. You have to understand that. Don’t worry about what happened in the past; that you couldn’t do this and you couldn’t do that. These things happen because we are human beings and have strong delusions, but now you can put effort and do your best. My idea is that you should follow universal education, the seven things that are the basis, starting with being kind to others day and night; then practice the sixteen human dharmas.1 Follow that. Then the ten divine dharmas after that. Those seven things at the beginning bring so much happiness and good luck in the life. Recite the Thirty-five Buddhas more often, but without a distracted mind. It is the Thirty-five Buddhas but think it’s the Guru sending light to you and purifying your negative karma and obscurations collected since beginningless rebirth. The other thing you need to do is Lama Chöpa tsog. On the tsog day, you can ask to do more of the tsog verses ting dzin ngag dang… and you can offer numberless oceans of nectar tsog to the Guru-Buddha. After each OM AH HUM generate great bliss, and visualize light is sent to you purifying all the negative karma and imprints collected since beginningless rebirth. A student, a nun who had disrobed, wrote to Rinpoche. She had health problems and had become very depressed and isolated. She said she couldn’t study or practice Dharma. Rinpoche gave the following advice. Thank you very much your kind letter. It’s most important that you were a nun for ten years and you tried very hard. You studied the Master’s Program and the Basic Program for ten years, so you did much better than me. I didn’t finish my studies, so wow, wow, wow, you are much better than me. Your study and knowledge is so good. You made so much preparation in the mind to actualize the path and to achieve enlightenment, so I rejoice, rejoice, rejoice. There is no time for depression, only to rejoice, so much to rejoice in. You met His Holiness the Dalai Lama, Chenrezig, and Geshe-la. You received teachings from a perfectly qualified teacher, so rejoice, rejoice, rejoice. There is no time to regret and so much to rejoice in. You met the Buddhadharma that shows the four noble truths and the path to achieve liberation from samsara. Not only that, you met the Paramitayana that shows the path to achieve enlightenment and to liberate the numberless sentient beings from the oceans of samsaric sufferings and bring them to full enlightenment. You met the Mahayana Tantra where you can achieve enlightenment in one life and even quicker—with Highest Yoga Tantra you can achieve enlightenment in one lifetime. It is the quickest way to free the numberless sentient beings from the oceans of samsaric sufferings and bring them to full enlightenment. Wow, wow, wow, wow. Amazing, amazing, amazing, amazing. So there’s no time for depression. Wow wow, wow, wow, wow! You met the lam-rim, particularly the instructions on the practice of lo-jong, the method to utilize the difficulties and problems in the path to enlightenment, in order to enlighten numberless sentient beings and free them from the oceans of samsaric suffering. All the sentient beings are so important, like you. Numberless sentient beings are so important like you; soooooooooooo important like you. You are just one person, however much suffering you have, however much happiness you have is just for one, so now look at the numberless sentient beings in each realm. Can you imagine? You have done a good job. Now you are lay person, so you can still achieve enlightenment, you can still practice the lam-rim and lo-jong. That is the main purpose of your life. That is the purpose of your life, the purpose of breathing, that is why you are breathing. If you can, study Liberation in the Palm of your Hand and Lama Tsongkhapa’s Middle Lam-rim. That should be the main teaching, just like the wandering ascetics, the monks whose only belonging is the Lam-rim Chen-mo. They don’t have anything else. They don’t carry anything but the lam-rim, so be like that. The lam-rim is the main reason to study, to meditate, so you have to actualize that, otherwise you will suffer. Without realizations on guru devotion, renunciation, bodhicitta, right view and particularly tantra, you will be suffering in samsara endlessly. Do you want to do that? I don’t think so. At least to be born in the pure land when you die, so then do Vajrayogini practice. As you have received the initiation, so it’s good to continue. Do the Six-session Guru Yoga, and do Vajrasattva practice in the evening. If you can, once a day if possible, do prostrations by reciting the names of the Thirty-five Buddhas. If it’s not possible to prostrate, then with your palms together, visualize the whole earth covered by your body, as Thousand-arm Chenrezig, and do prostrations to the Lama Chöpa merit field. Then at night do Vajrasattva practice and the King of Prayers, or the dedication chapter from the Bodhicaryavatara [A Guide to the Bodhisattva Way of Life, by Shantideva]. If you can do that, then it is very good. Then you can go to Amitabha’s pure land when you die. Also do the other dedication prayers, like Lama Tsongkhapa’s Prayer for the Beginning, Middle and End, A Daily Prayer to Maitreya Bodhisattva, and the Prayer to be Reborn in the Land of Bliss. [See Eight Prayers to Benefit the Dead.] Each night you can do a different prayer or if not, then at least do the King of Prayers. Attached is my morning motivation. [See Daily Meditation.] In the morning if you can, do Lama Chöpa; if not, then do Ganden Lha Gyäma. That is very, very good, if you can try. But you should know it’s not just practice for this lifetime. The practice becomes preparation for all your lives, for eons, eons and eons, for all your future lives. It’s preparation for going to the pure land, then also for enlightenment, to be free from samsara, to achieve enlightenment and then to benefit all sentient beings and enlighten them. Thank you very, very much. I accept whatever you confess, thank you very much. Don’t think you are alone. Please continue to recite OM MANI PADME HUM and Chenrezig prayers. This is most important for yourself and for numberless sentient beings in each realm. Even nowadays, it’s so important globally, for this country and for this world, for your family and for yourself.